Saturday 6th July saw carnival athmosphere arrive to the Yorkshire's beautiful town of Yeadon. All sorts of games and stalls packed the Yeadon Tarn festival venue, followed by a parade down the high street. 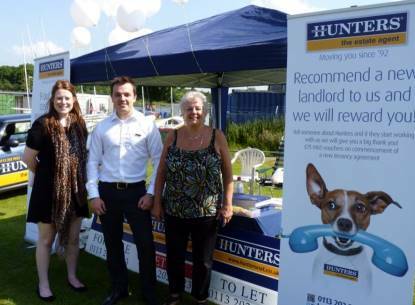 Staff from the Hunters branch in Yeadon were busy on their yellow and blue clad stall supporting the event, giving out Hunters goodie bags and hosting a 'guess the house price' game with 12 houses on a board. £2 a go to guess the total value with all proceeds going to the Yeadon Carnival Fund. The winner won a meal for four at the Stansfield Arms. The Hunters branch in Yeadon also donated a £150 voucher for the Harrogate Turkish Baths. A good day was had by all in the sunshine - including Hunters Yeadon Franchisee David Metcalfe, although he celebrated the day 1000s miles away in Bali during his honeymoon! Congratulations to David for tying the knot and a big well done to the team at Yeadon for taking part in this great, local event.